Don't forget, the Secretary is always looking for people wanting to give him a hand with administration tasks and any number of creative, Internet and Digital Media oriented projects. He can provide all the training and support that you will need to do any or all of these jobs. Unfortunately, at this time there is no payment for this work. However, if we are any good at fund raising, this will change. The third News Letter is still being put together. If you have anything which you would like to appear in the News Letter, written content, photos, ideas, poetry, etc, please get them to David ASAP for inclusion in this next edition. The archive has been removed for the time being. If this causes an issue for you and you would like a copy of the earlier publications please contact the Secretary. Email is a good avenue to try first off then the documents can be attached to the secretary's reply. 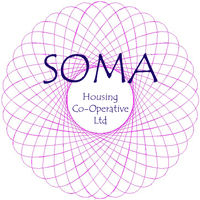 The SOMA Secretary eMail address is secretary@somahousingco-op.org.uk.